Hello all. Welcome to the final day of my 12 Days of Christmas decorating series. Wow what a trip this was. As always some of the projects I did turned out so much better than I thought, others never made it to the blog because of total failure and than there were the ones that surprised even me because I didn’t see them coming until they started to develop under my hands. 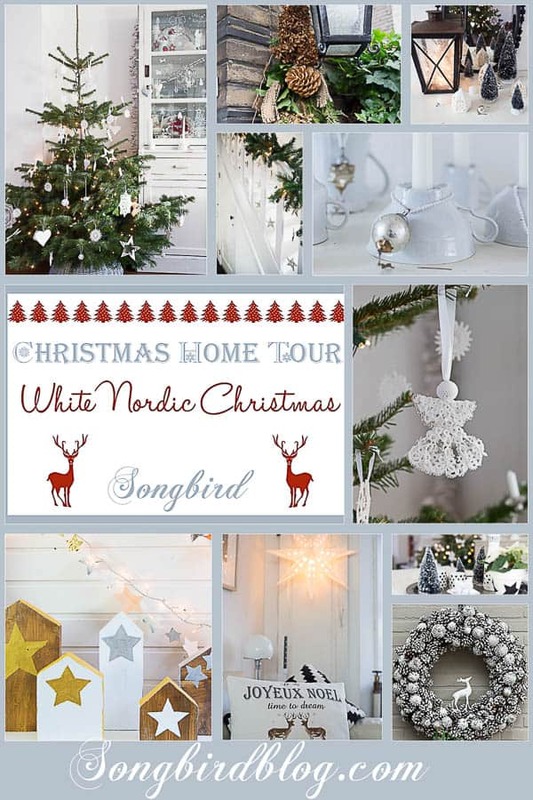 The last day is a special day because I welcome you all to my Christmas home tour of my white Nordic Christmas House. If you are hopping over from Southern Hospitality please feel welcome, it is so nice to have you here! Come on in and take a look around. I’ll be the one in the kitchen with an endless supply of hot chocolate (spiked if you like) and spicy tea and I’ll stay out of your way so you can browse around. I’ll just point you in the right direction if you might want to know more about a project. 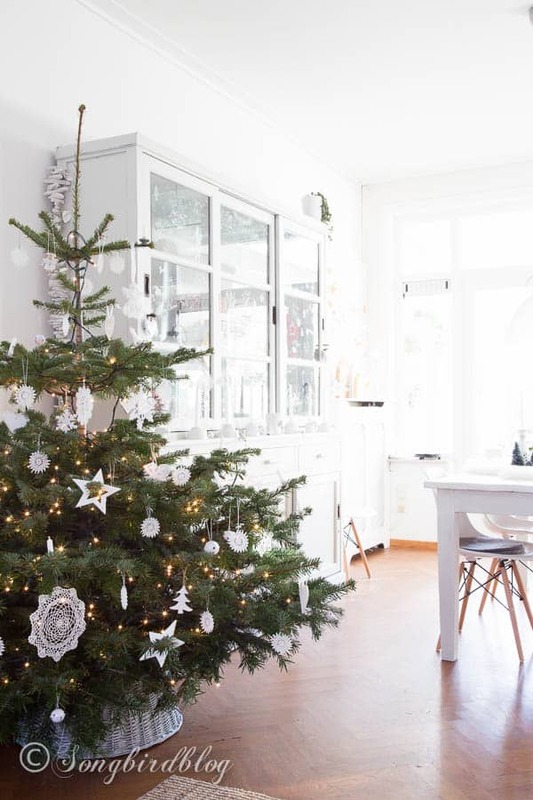 White Christmas tree with homemade tatted ornaments and with too easy no-crochet ornaments. Don’t miss my Giveaways. That are running in honor of my 12 Days of Christmas Decorations series. Click the images below to be taken to the post with the giveaway. You can still enter! It was so fun to have you all over to share our mutual love for decorating. I am the final stop on the Christmas home tour that started five days ago on Monday. If you want to visit the whole line up you can find them at the host of this home tour series Chris from Just a Girl. This concludes this years 12 Days of Chrismas Decorations. But don’t forget tomorrow we are going to have another kind of party on all of our five blogs. There is a link party for everyone. And we will all be sharing our favorites of the linkups all through the weekend and next week, so make sure your project is on the list. Funkyfunk Interiors : SPECIAL STENCIL GIVEAWAY!! There’s just no way I can select a favorite because I love it all. May I move in with you? Your home is gorgeous! And I always always love your trees. They resemble real forest trees that look so natural. I had to scroll several times past your stairs… total win painting them out white! I loved your nordic tour! Absolutely beautiful! I always get excited when I see your emails in my inbox and I always wonder how you can come up with such great new ideas every year! Marianne, your home looks amazing. I love all the DIY touches. The folded star garland and the decorated hutch windows have to be my favorites. But, I love the tree and the wreath and and and…okay, it’s hard to pick my favorites. Thank you for giving us the tour. I’ll take my hot cocoa with some Bailey’s please ;-). marianne, your home is amazing! i love the stars on the stairs and everywhere else for that matter! just beautiful!